Medieval Spanish Chef: GUISANTE WITH PEASE PORRIDGE HOT! L. Pisum sativum (a variety of), Ar. besilla, julbān, Fr. pois, Chile arveja, MEng pise, pesyn, peson, peswon, pease, Eng. pea. Medieval peas were not green. They were dark gray, small smooth and starchy seeds, similar to split peas. They were dried and stored to be used as food during the winter. The origin of this very ancient plant is not clear. Carbonated peas found in “Spirit Cave”, on the border between Thailand and Burma are dated to 9750 BC. 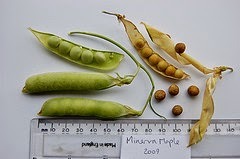 Although there is no trace of peas in Babylon, peas were found at the dig in Jarmo in northwestern Iraq. Peas found from the Bronze Age in Swiss villages are thought to be from 3000 BC. There is no trace of them in Israel during Biblical times but oasis or wild peas, Pisum elatius, cultivated in Algeria today, have been found in Egyptian tombs. They are believed to be natives of Egypt. Greeks and Romans are thought to have cultivated them from around 500-400 BC. In Athens, pea soup was sold on the streets. Fried peas were sold at Roman theaters as snack food. Apicius provides nine recipes for peas indicating their importance in Roman cuisine. His recipes include cooking them with leeks, pork, sausages, poultry, liver, giblets, egg sauce, liquamen and/or wine. Peas were taken from India to China and subsequently Arabs brought them to Andalusia but the English claim that Romans took dried peas to the island. The species Pisum arvense, the field-pea (a native of the Mediterranean and North Africa) was the most valued during the Al-Andalus period. Documents contain a recipe of peas in their pods boiled with cumin. When ready to serve the pods are discarded and spices or cheese are sprinkled over the peas. These peas really did not seem to be favored. Avernzoar in the 12th C declares that if humans eat them they will not be free of the harmful properties contained in peas but prior to that Galen claims them useful in medicine. There is confusion in texts as seen in Anon. Andalus. Huici translates the Arabic himmaş as “peas or chickpeas,” while Perry maintains they are chickpeas. Vilanova, the 14th C wrote that peas should not be eaten until half way through the meal or they could cause vomiting. Being a cool-weather crop, it appears they were more plentiful in England and Scotland than in Spain especially, in market gardens. “Pease porridge hot and pease porridge cold” provided a wholesome and cheap meal in all poor homes. This was a thick stew of dried peas flavored with salt pork and made in a huge kettle. It took about three hours to cook. The household received hot porridge for the main meal while the fire blazed. As the fire was extinguished at night, they had cold porridge for breakfast. (Ironically, the “Pease porridge” nursery rhyme is also a hand warming game.) Everyday, more vegetables were added to the pea pot and it was reheated. The basic porridge could last for nine days or a month. During grain famines peas were ground into flour to make bread by Christians and Muslims in Spain. Sailors, including Columbus who introduced them to America, carried them dried on journeys. Catherine de Medici is said to have brought piselli novelli, petit pois or tiny green peas, to France in 1533 when she married Henry II. Sugar peas were introduced at about that time. It is said that the Dutch introduced the French to the method of eating freshly shelled peas at the end of the 17th C. The peas known today then became the rage in French cuisine. Remove peas from pods. Boil in water until tender. Put them in a food processor, make a purée and set aside. Parboil orach. Remove from the pan and squeeze dry. Chop the leaves and set aside. Remove bones and fat from lamb and cut into small pieces. Heat a frying pan. Add barely enough oil. When hot add the lamb and spices. Seal all sides. Fry until browned. 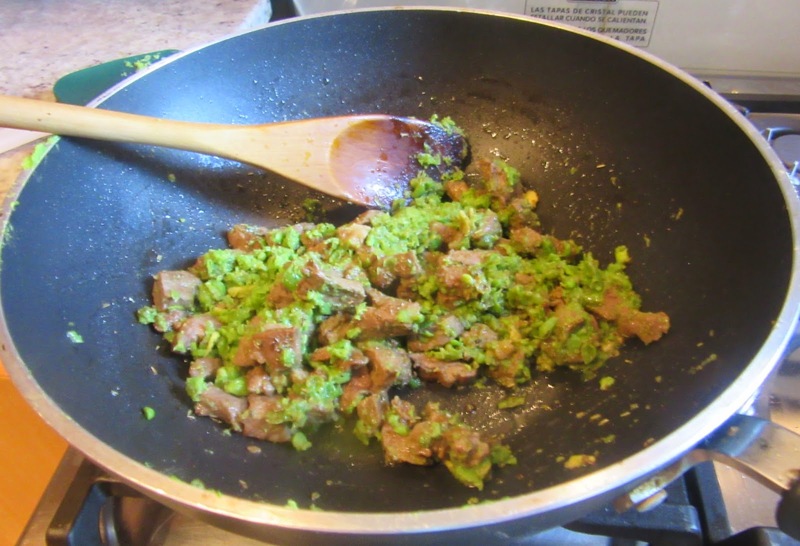 Add pea purée and mix well with the meat. Add orach and do the same. Turn off the heat and add the cheese. Mix it well. Add 2 eggs slightly beaten and blend them into the mixture. Make turnover dough. Roll it out and cut it into circles 4” in diameter. 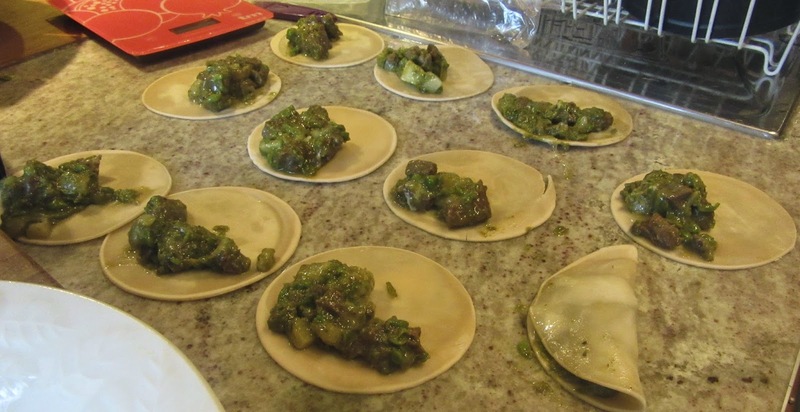 Place a spoonful of the meat mixture on each circle. 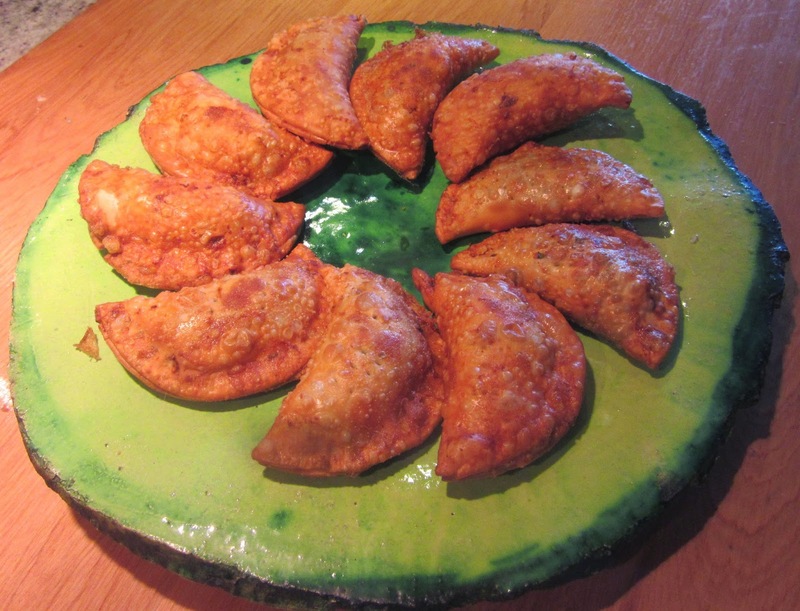 Fold it over to create a crescent with the dough. Slightly beat the third egg and paint the edges of the turnover with a small paint brush. Push the edges down with the handle of a spoon. Heat a frying pan. Add enough olive oil to cover the turnovers. Fry them. When both sides are golden brown, remove them from the pan and put them on paper towels to remove access oil. Put them on a platter and serve warm God willing. Cut up lamb in large pieces and put with it spices, soaked garbanzos, oil and salt. When it has fried, pour in enough water to cover. And when it is about done, throw in orach [a leafy vegetable related to spinach]. When it is done, throw in fresh cheese cut up in pieces like fingertips, and break eggs into it and crumble bread in it, and sprinkle it with pepper and cinnamon, God willing. Hucci maintains that the Arabic word himmaş means peas or chickpeas. Perry appears to think it only means chickpeas. Modern green peas were used as gray dried peas were not available. If orach is not available, spinach leaves can be used as a substitute. The original recipe calls for covering this with water and gently boiling until the meat is tender. As the meat was from a lamb and diced, this step is not necessary.